This studio, fully furnished apartment is located on Pyrmont St, Pyrmont and comprised in a heritage listed sandstone terrace house dating back to 1855. The property which is only a ten minute walk from the Sydney CBD across Pyrmont Bridge is ideal for both the corporate or holiday traveller looking for short and long term self catering accommodation requirements at very affordable prices. Pyrmont is a suburb, south of Sydney CBD consisting of restaurants, cafes, bars, Star City Casino and the Sydney Fish Markets. 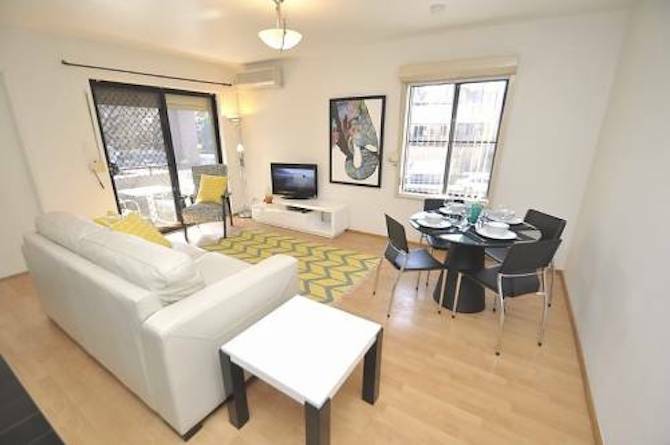 This studio apartment comes complete with towels and linen, modern furniture, fixtures and fittings including a DVD player, cable TV (Foxtel), plasma TV and air conditioning.